With one of the highest infection rates in the world, drug-resistant strains of tuberculosis are causing a crisis in PNG. Throughout the latter half of the 20th century, the global fatality rate for TB was greatly reduced through the administration of rigorous antibiotic treatment. However, the development of antibiotic resistance has led to the rise of two aggressive strains of the disease. The increased incidence of both Multidrug-Resistant TB and Extensively Drug Resistant TB in PNG has occurred at an alarming rate. These drug resistant strains are less susceptible to treatment by the most effective TB medication. Thus, patients are left with a more severe strain of infection and less effective treatment options. Health professionals have been particularly concerned of late about the Papua New Guinean island of Daru. With 160 of the 15,000 inhabitants of the island infected with drug-resistant TB as of January this year, this area has the highest infection rate in the world. Here it is believed that a unique strain of drug-resistant TB has developed. Professor Brendan Crabb, of Australia’s Burnett Institute, indicated that factors such as minimal health care, poor housing, and nutrition, may have contributed to the fast spread of this unique strain. According to the PNG Institute for Medical Research, many remotely-situated TB sufferers die of the disease without ever receiving a formal diagnosis. Furthermore, only 50 percent of those infected with TB have access to “adequate treatment.” This is problematic, as TB convalescence can require a daily regimen of injections, oral medication, and supervised medical care for anywhere between six and 24 months. Inconsistent treatment can not only increase the disease’s severity but also strengthen the infection’s resistance to treatment options. Government commitment is vital for tackling the pandemic. The World Health Organization has urged the PNG government to maintain a sense of urgency in their emergency response efforts. Additionally, the Australian government is monitoring the distribution of AU$60 million in aid targeted at the TB response over the next six years. On World Tuberculosis Day 2015, PNG Prime Minister Peter O’Neill thanked the Australian government for its ongoing support. He also urged the nation to encourage patients to finish their full course of drug treatment in an effort to combat the drug-resistant strains. Moreover, international non-governmental organizations continue to support the TB response, sending medical professionals to meet the demand for care and assisting with the development of health facilities. In 2014, Médecins Sans Frontières imported an Unmanned Aerial Vehicle to deliver saliva samples from suspected TB patients in inaccessible rural areas to metropolitan hospitals. This has improved rates of patient diagnosis in remote regions. Representatives from the PNG Health Department and World Health Organization visited the Western Province earlier this month to assess current management strategies for drug-resistant strains. PNG’s TB public health education and treatment services must be prioritized by the international community, the PNG government, and community health workers. More must be done multilaterally to curb the recent escalation of drug-resistant cases. 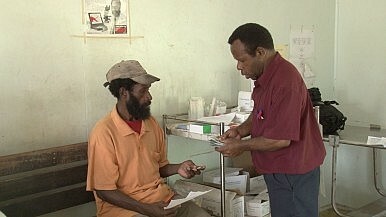 The TB epidemic isn’t just a national public health threat for PNG. If not adequately managed, the epidemic could have social and economic ramifications for the entire Asia-Pacific region. Georgia Eccles is currently pursuing Bachelor of Science and Bachelor of Development Studies at The Australian National University. Eccles also volunteers for Future Leaders Australia and The West Papuan Development Company. Limited public healthcare and misinformation have given PNG the highest maternal mortality rate in the Asia-Pacific.